With 95 percent of the votes counted in the parliamentary elections in Israel, the country woke up this morning to the news that the incumbent Prime Minister Benyamin Netanyahu will likely remain in power with his current coalition partners. 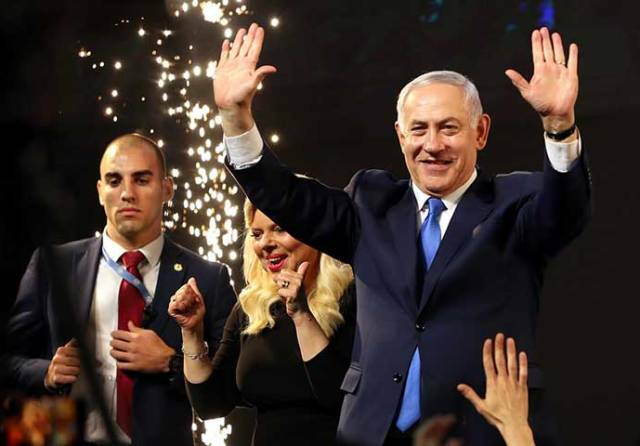 The Brussels Times / 10 April 2019 – With 95 percent of the votes counted in the parliamentary elections in Israel, the country woke up this morning to the news that the incumbent Prime Minister Benyamin Netanyahu will likely remain in power with his current coalition partners. For the EU, which normally congratulates the victors in democratic elections, the results do not bode well for EU-Israel political relations which have reached an all-time low during Netanyahu’s populist government under the influence of extremist and sectoral parties, especially if his new government will backtrack on the two-state solution. The exit polls after the ballot stations closed at 22 pm yesterday evening (9 April) and gave Netanyahu’s main opposition party, the newly formed centre party Blue White under former chief of general staff Benny Gantz, a slight edge over Netanyahu’s Likud party. But in the morning, they both ended up with 35 mandates of the 120 seats in the Israeli parliament, Knesset. Together with his former coalition parties, that apparently will recommend him for Prime Minister, Netanyahu will be able to form a new government based on a solid majority of 65 mandates. The party with the most mandates and the biggest chances of forming a new government will be asked by the president to form the government. This time the government under Netanyahu risks becoming ever more far-right and extreme due to an increase by 3 mandates for the two ultra-orthodox parties (16 mandates together), whose supporters followed their religious leaders, and the entry of an openly new racist party (5 mandates) that wants to annex the occupied territories. The New Right party led by the current justice and education ministers - who politicised the judiciary and the education system - did not pass the electoral threshold (3.25 percent). The final result after all the votes among soldiers have been counted will be known on Thursday and may push the party over the threshold. The leftist parties, Labour and the human rights party Meretz, lost voters to the Blue White party and received only 10 mandates together. The four Arab-Palestinian parties that had campaigned under a united list in the 2015 elections were divided this time. They lost 3 mandates and gained only 10 mandates together, which is far below their potential. Despite calls for making their voice heard and influence Israeli politics, voter turnout among the Arab-Palestinian minority was lower than usual and reached only 50 % compared to 62 % in the previous elections. Overall voter turnout showed a certain indifference among the population and was only about 68 percent compared to 72 percent in 2015 dispite the fateful electons which will determine Israel`s future as a liberal democracy. The election results reflect a fragmented and polarized society where demographic changes give extremist parties an unproportionable say in forming the government and extracting concessions from the Prime Minister. The results dashed the hopes of many Israelis for a change in government and a new political course to restore the rule of law, resume the peace process and tackle social issues. “We’ll never withdraw from our responsibility to represent more than one million Israelis who asked us for something else,” he promised his disappointed voters. Despite his victory, Netanyahu has reason to be worried since he soon is facing a hearing on charges of corruption, fraud and breach of trust. He is likely to be indicted and forced to suspend himself, unless his new government will enforce parliamentary immunity for him or manage to pass a new law that will protect him retroactively from prosecution as long as he is Prime Minister.